On a warm late-winter weekend in March of 2010 I decided that I wanted to go hiking. I had already hiked around many of the local trails and was looking for something a little more substantial. 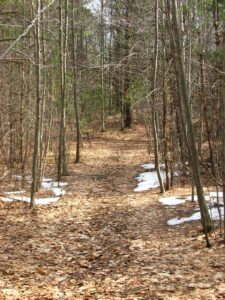 A quick search on the internet for nearby hiking trails led me to the Finger Lake Trails Conference website. I explored the website and learned that the FLT stretched across New York State for over 550 miles. On one page I found an Excel spreadsheet of all the access points on the trail; this was exactly what I was looking for! I downloaded the spreadsheet and found the access points that were close to where I lived; a 40 minute drive away. 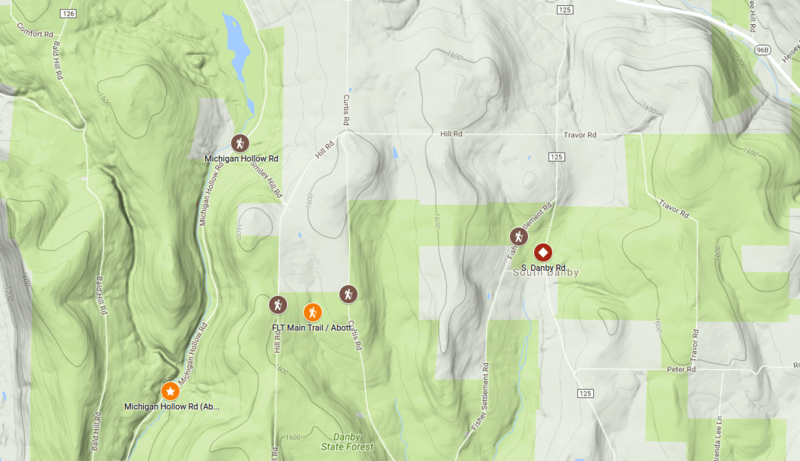 I mapped out a short hike, only about six miles from Michigan Hollow Road to Fisher Settlement Road and back. Using a scrap sheet of paper, I wrote down the names of the cross roads and the distances. This practice I still continue even now. I also “explored” the area using Google Earth and I noticed there was another road near my proposed turn-around point that was not listed in the Excel file, S. Danby Road. I wondered why it was not marked. Perhaps I might continue on past Fisher Settlement Road and explore if I had time. I had an old backpack, the kind used for school books, and I packed a few water bottles and a couple of granola bars. I ate a quick lunch, folded the paper with the access points, put it in my pocket and headed out. It was a bright and sunny day, temperatures were in the low 50s. Nearly forty minutes later I was turning off Rt 96B near Danby onto Michigan Hollow Road. The road passed by several houses before changing from pavement to dirt and gravel. A small cloud of dust kicked up behind my car as I drove on. I slowed and began looking for the FLT signage, I had not seen it before so I was not exactly sure what it would look like. There were several cars parked along the shoulder of the road at one point. I thought that it might be the trailhead, but I didn’t see any signs so I continued on down the road. A short distance later I found an FLT sign and pulled over to the side of the road. I grabbed my backpack and started up the trail heading east. It was a beautiful day, the temperature was great and the sky was a deep brilliant blue. I found the first blaze just off the road; it was orange. I had researched enough to know that the main FLT trail was blazed white and that loops were orange. The main trail was probably back where all the cars had been. 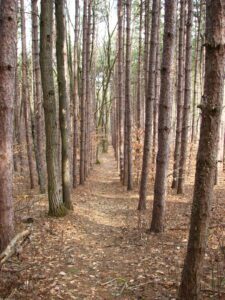 I decided to continue on – the loop would eventually connect into the main trail. The trail continued to climb on its way up to Hill Road – aptly named. I saw small remnants of snow in the more shaded areas of the trail and paused to take a few pictures. I could feel the cold air coming from the snow piles swirl around my feet mixing with the sun-warmed air. It created a noticeable contrast. I reached Hill Road and crossed over and continued following the trail. The trail began to descend and then turned to the left heading uphill again. Near the top of the climb I came to the main trail junction, now I had a decision to make: left or right? I still had my bearings and knew that to reach the next access point I needed to turn right (east) onto the main trail. I soon came to Curtis Road and crossed over. The trail continue to rise and fall gently over the next 1.3 miles. As I neared Fisher Settlement Road I came to a line of tall pine trees. They had clearly been planted for harvesting. The path followed a long straight line through the trees making it almost seem as though I were in a maze with high walls. I reached Fisher Settlement Road, my turn-around point. It was mid-afternoon now, but I still had time. I decided to press on just a little further. Within a matter of minutes I came to a parking area on S. Danby Road. I climbed over some piles of snow and gravel at the back of the parking area and walked out on to the road. This would be my starting point for the next hike. I decided to turn back now. A few moments later I was back at Fisher Settlement Road. I decided to stop and take a short break. After some water and a granola bar I started back. I passed back through the row of trees and crossed over Curtis Road. Soon I was back at the junction with the loop. I decided to continue to follow the main trail. Just after passing the loop junction I found a small stream with a small bridge built over it. 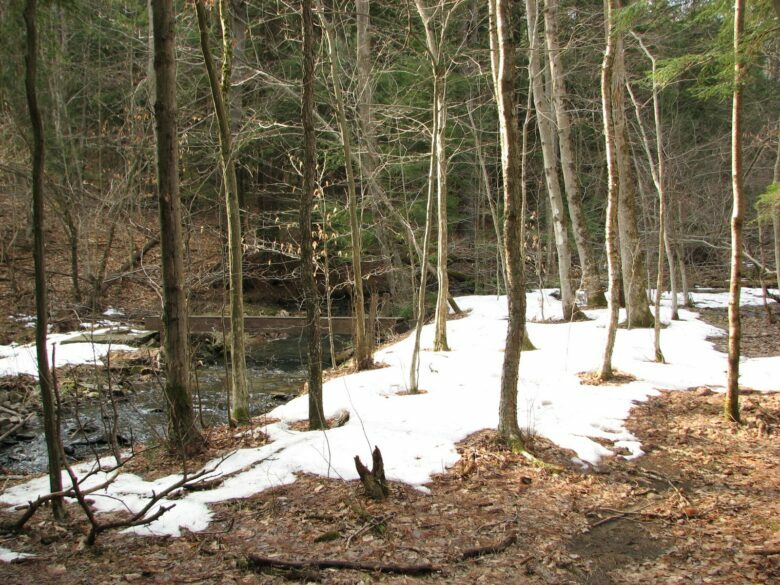 Snow was still in many large patches; the stream helped to keep the temperatures around it cooler. I took a picture of the snow, stream and bridge and then moved on. The trail made a gentle climb to the top of a hill and then turned right to descend to Michigan Hollow Road. I came out of the woods onto the road. It was still bright and sunny and warm. I recognized the area that I had passed by earlier and knew my car was a short distance down the road. I turned left and followed the dirt road down to my car. My short hike had been great and I knew I wanted to explore more of the FLT; I had to know what was around the next bend in the trail. I had not yet decided that I wanted to do an end-to-end; that decision would come after a few more hikes. My next hike on the FLT would have to wait until May, other commitments prevented an April hike.